Since its designation as a national park in 1872, Yellowstone National Park has been a cherished part of the Wyoming's rich tapestry. It’s easy to see why. The very definition of “unspoiled,” Yellowstone has served for generations as a sort of living museum, its natural splendors giving visitors an up-close-and-personal glimpse of what the continent was like in the days before recorded history. With 2,219,789 acres of sprawling wilderness to explore, Yellowstone stands as one of North America’s greatest assets — and it’s open year-round for visitors to enjoy. The park’s vast network of trails will take hikers to hundreds of secluded places where vehicles are prohibited. You’re bound to see wildlife wherever you go. 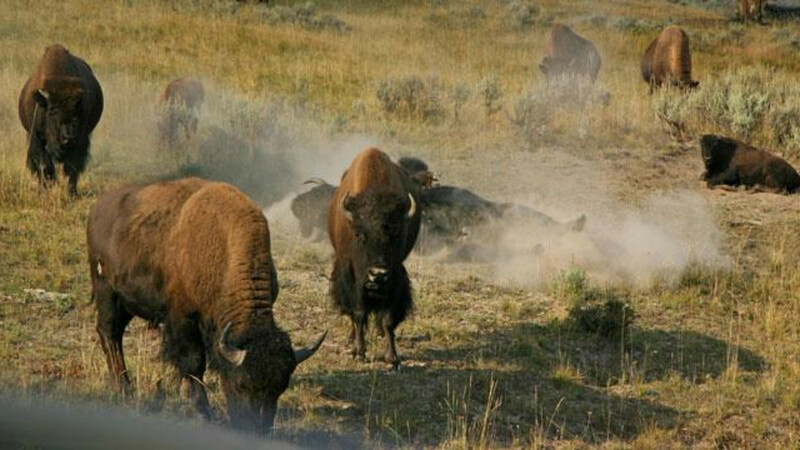 Yellowstone’s legendary wildlife includes grizzly and black bears, gray wolves, buffalo, elk, pronghorn antelope, trumpeter swans, eagles and much more. 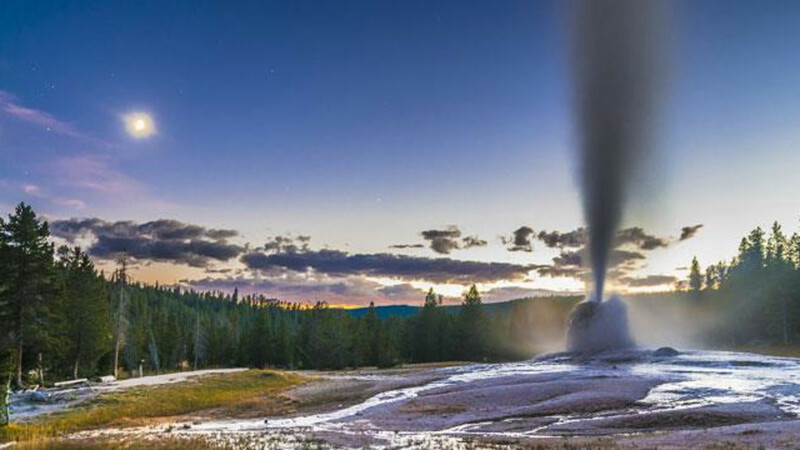 The iconic spots — Old Faithful, Lower Falls, Yellowstone Lake — will be familiar from paintings and photographs, but seeing them in person is a humbling, enthralling experience. They’re not just as good as you’ve heard — they’re better. 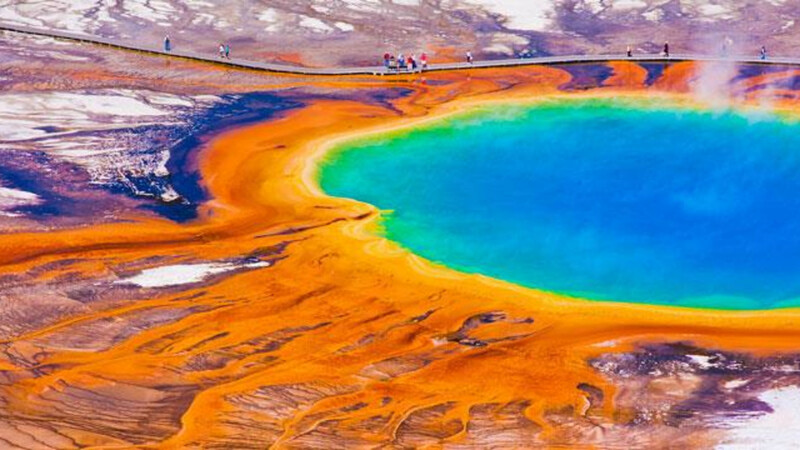 Where is Yellowstone National Park? You can access two entrances to the National Park from Wyoming. The east entrance is on highway 20 (also highways 14 and 16 at this point). Yellowstone Regional Airport is located about 50 miles away in Cody and has service from Salt Lake City and Denver. Vehicles can be rented in Cody as well. The south entrance is on highway 89 (also 191 and 287 at this point). This entrance is in Grand Teton National Park and is about 60 miles from Jackson. Jackson Hole Airport is located inside Grand Teton National Park and has service from several cities including Salt Lake City, Dallas/Fort Worth, Chicago, Atlanta and Denver. Vehicles can be rented in Jackson. The entrance fee for Grand Teton National Park also includes entry to Yellowstone National Park. Roads inside Yellowstone National Park start to open for the summer season in late April but are not completely open until the end of May, depending on the weather. Check ahead of your visit for road openings and closures. Some roads are open to bicycles and other light traffic before they open to motorized vehicles. RVs and trailers up to 72 feet are allowed inside the park. All gates are open 24 hours a day in the summer unless weather conditions or construction cause them to close. Visitors should allow plenty of time for driving through the park. Wildlife on or near the road can cause delays. Various bus tours for are available that depart from towns around both the south and east gates. Yellowstone offers a number of recreation opportunities with specific rules and guidelines that visitors should be familiar with prior to arriving at the park. These include fishing, backcountry camping, hiking, horseback riding and boating. Dogs and other pets are allowed in the park with strict guidelines designed for their safety and the enjoyment of all visitors. Horses entering Wyoming must have a health certificate within the last 30 days. Both the state and the park require a negative Coggins test within the past year. 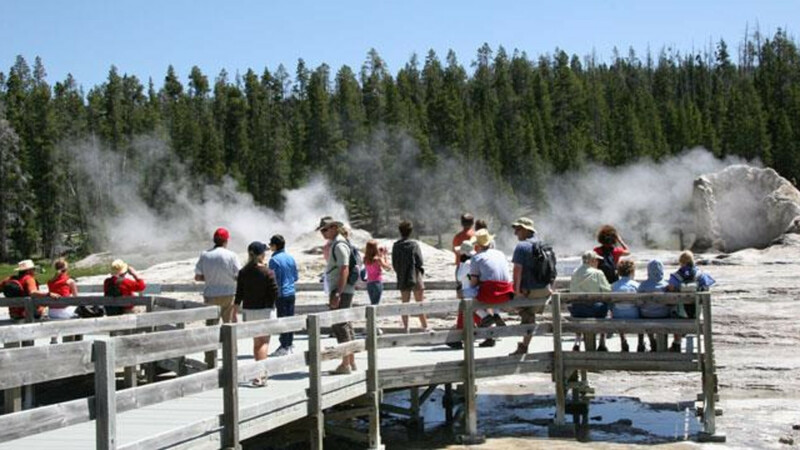 In the summer, visitors may select from eight locations within park boundaries with hotels and/or cabins including Yellowstone's Canyon Lodge & Cabins, Grant Village, Lake Lodge Cabins, Lake Yellowstone Hotel & Cabins, Mammoth Hot Springs Hotel & Cabins, Old Faithful Inn, Old Faithful Lodge Cabins, and Roosevelt Lodge & Cabins. Amenities and dining options vary at each location. All park lodging is nonsmoking and rooms do not have televisions, radios, air conditioning or internet. Numerous sites are also available for tent and RV camping. 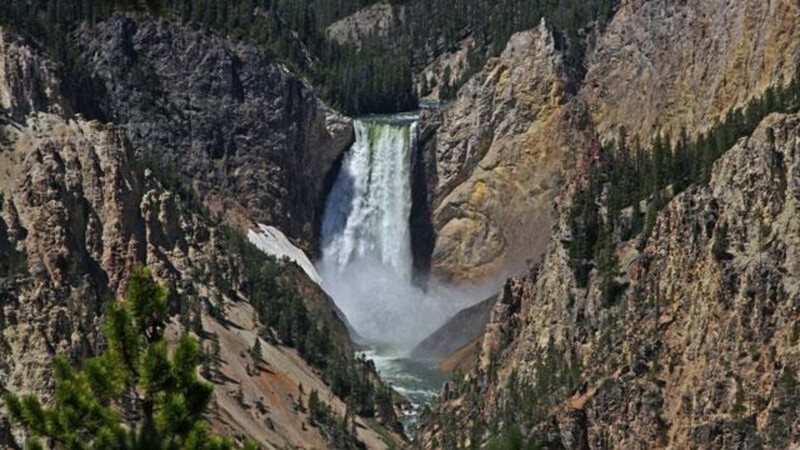 View the listings of all campsites in Yellowstone. The National Park Service provides resources, including videos and a trip planner, for both winter and summer backcountry excursions. Weather in Wyoming is unpredictable. During both the summer and winter seasons, be sure to bring plenty of layers so you can add and remove clothing as your own comfort dictates. Even at the height of summer, temperatures can drop to below freezing at night. Be sure to bring a warm, waterproof jacket and a hat. Plenty of socks to keep your feet warm and dry are also a good idea. 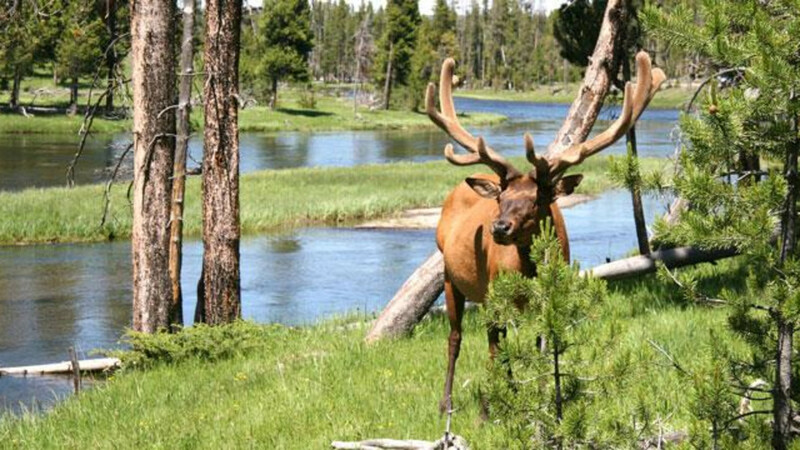 Although the wildlife in Yellowstone National Park may seem tame, important safety rules should be followed at all times while in the park and will not diminish your enjoyment of the animals. Obey rangers and law enforcement officials immediately if they make a request. Remember to stay hydrated and to pace yourself while enjoying your high altitude nature experience. Most roads into the park are closed in November and open again in late March or April, as conditions allow. Visitors can travel through the park in snow coaches or on snowmobiles with an authorized guide. Visitors may cross country ski or snowshoe in the park on miles of groomed trails, on any unplowed roads and in the backcountry. A backcountry use permit is required for all overnight trips. Contact a park ranger at a visitor center or ranger station before beginning a trip. Warming huts are available throughout the park. In the winter, guests can stay inside the park at the Old Faithful Snow Lodge and Cabins or Mammoth Hot Springs Hotel. In the spirit of the nature experience, neither hotel has television, internet, or radios. All lodging is nonsmoking. Both locations have casual dining facilities. Visitor centers at these locations are open in the winter; all others are closed. Cross country ski and snowshoe equipment can be rented or repaired at “the Bear Den” at both lodges. Group or private lessons can also be arranged. As the authorized concessioner in Yellowstone National Park, Xanterra Parks & Resorts will supply much of your food, lodging and entertainment options. Visit their website for more information.